Often their appearance has no one specific cause. It’s just part of getting older and associated with the loss of elasticity in our skin and supporting and connecting tissues. 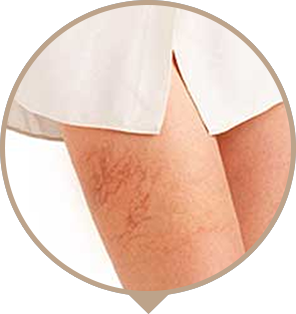 Dating back to the 1930’s Sclerotherapy is a medical procedure used to eliminate varicose veins and spider veins. Sclerotherapy involves injecting a solution directly into the vein. You may have spider veins appearing on your face around your nose, eyes, chin and cheeks. 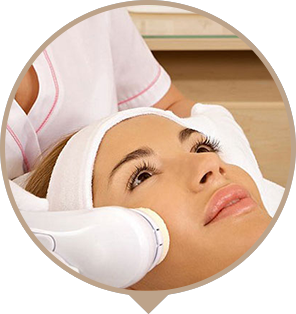 These can be treated with much success using laser treatments with no down time required. Varicose veins occur in both men and women for a variety of reasons including but not limited to: poor circulation, genetics, obesity, pregnancy and prolonged standing. Varicose and spider veins are also known as superficial varicosities and are a dilatation of the skin venules, which are the fine blood vessel at the surface of the skin. These vessels can become large and can cause a dull ache in the legs after prolonged periods of standing. Although these blood vessels carry blood, they are not necessary to the circulatory system, so if their presence is causing problems, they can be treated by injecting a solution that will cause the treated veins to disappear. Spider veins are also known as thread veins. The cause of spider veins is not known, but genetics, local trauma, and hormone levels can contribute to their development. Spider veins can also become more numerous with age and mostly occur in women. Spider veins form because small veins just under the surface of the skin expand, which mostly occurs in the legs. They tend to look like purple or red web patterns. Spider veins are also referred to as telangiectasia or broken capillaries. Spider veins don’t usually pose any threat to your health, but may produce a dull ache or burning sensation in the legs after long periods of standing. There is no way to prevent spider veins from forming, but the use of support stockings, weight loss, and regular exercise may help in some cases. Varicose veins are enlarged or swollen blood vessels that are caused by weakening in the vein walls or valves, and tend to be located deeper than spider veins. 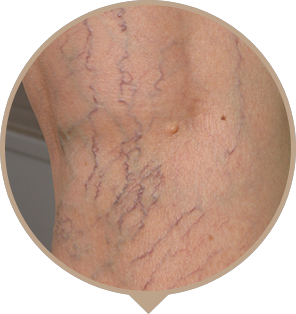 Varicose veins can sometimes feel raised and often appear blue. Advanced cases of varicose veins can cause harm to your health as they can be associated with the development of ulcers and phlebitis (inflammation). Roughly one quarter of patients that have spider veins also have varicose veins, which require treatment before the spider veins. There is no known cause of spider veins. Some families are predisposed to this condition, particularly females, though certain things such as pregnancy, birth control, tight garter belts or shapeware, trauma and pregnancy can also cause spider veins. Varicose veins can be caused by weak or damaged veins. If the valves become weak, blood can remain in the vein and collect there, which can cause the vein to swell. Vein treatments – how does sclerotherapy work? Sclerotherapy is one of the safest (with well understood risk profile) and virtually painless vein treatments used to get rid of varicose and spider veins, and is able to improve blood circulation by limiting the amount of abnormal blood vessels. Sclerotherapy is the term used for the injection of a special substance into veins, and is most commonly used for spider veins. These tend to be more pronounced on the upper part of the outer thighs, but can occur on any part of the legs and may be associated with larger varicose veins. Sclerotherapy uses a microinjection technique; an appropriately trained doctor will inject small amount of solution into the spider and varicose veins. A number of different solutions can be produced depending on the circumstances. The solution washes over the tint cells that line the inner wall of the blood vessel, to dry out the cells without harming the underlying tissue. After the injection of the solution, the vessels will no longer carry blood and will begin to shrink. The blood vessel will eventually turn to scar tissue and be absorbed back into the body. The task of blood circulation will be taken up by other healthy blood vessels, which is the main reason blood circulation is improved through this procedure. Most patients are able to see some improvement in the treated vessels after several treatments, however, the process is gradual and usually takes about six months. The treatment works for removing existing spider and varicose veins, but does not prevent new ones from developing. Are there any side effects to sclerotherapy vein treatments? Any possible side effects of sclerotherapy vein treatments are rare, as the agent used has proved safe (with well understood risk profile) . 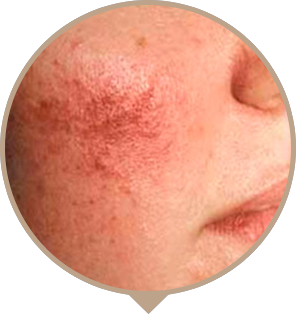 The most obvious side effect that can happen is a darkening of the pigmentation around the area of the injection that usually fades over time. This is a very rare occurrence but if it does not go away over time, can be treated by cosmetic laser therapy. It is also very rare that an allergic reaction can occur. Exercise should be kept to a minimum to prevent any possible deep vein thrombosis. How often will I need vein treatments? Each area should be treated every three to four weeks to allow for the area to heal completely. The number of times the treatment will have to be performed will vary depending on the number of areas being treated and how your body responds to the injections. It usually takes one to three injections to treat each vessel, and multiple vessels can be treated in each session. Before your treatment it is advisable that you not shave your legs for two days, but the doctor at our Melbourne clinic will be able to properly advise you of any and all the things you need to do before your treatment. 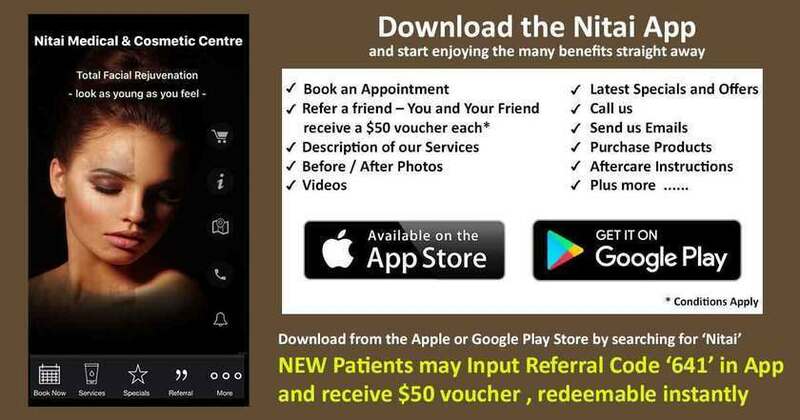 The above video shows Dr Shobhna Singh injecting to treat visible vein concerns at Nitai Medical & Cosmetic Centre. What should I do after my vein treatments? The doctors at our Melbourne clinic will advise you on the length of time you will need to wear them and any other post-treatment care you will need to do. You will not need any time off work and will be able to resume your regular daily activates the same day, as the procedure is usually painless.